Based on the hit new animated series from Disney Junior, Sofia the First. After Sofia’s mother marries the King of Enchancia, Sofia must adapt to an extraordinary life of royalty and learn how to be a princess – inside and out. To learn how to act like a proper princess, she also overcomes her new step-sister’s jealousy and the bumbling Royal Sorcerer’s evil scheme to take over the kingdom. All along the way, she gets the guidance and support of friends, both old and new. Dolls unlock phrases in the Magical Talking Castle! Girls can recreate their favorite moments from the hit series! Her lessons and adventures take place in many grand settings, one of which is the enchanting royal castle that she now calls home. The two-story play set not only offers traditional play opportunities but also adds fun interactivity to really bring the kingdom of Enchancia to life. 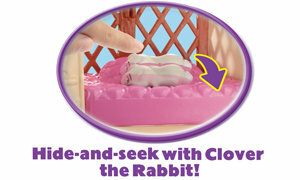 When girls place Sofia or Clover the Rabbit on the castle’s special base, they can “magically” hear 10+ phrases said in each character’s voice. But that’s just the beginning: bring in other 3-inch dolls and figures from the line (sold separately) to bring Sofia’s world to life and unlock more than 35 phrases. Sofia the First gets a magical royal castle to call home! Enter through the ornate purple doors that swing open and closed. Lounge on the chair in the living area or enjoy dining and dancing in the ballroom. Send Sofia up and down by clipping her to the banister of the staircase. Upstairs, Sofia can get her beauty rest or host a slumber party in the grand princess bedroom, or she can play hide-and-seek with Clover the Rabbit in his cozy window seat. Sofia can gaze out upon Enchancia and the castle gardens while standing on her balcony or enjoys a day of outdoor fun in the garden – just extend the castle’s bottom level to reveal a grassy picnic area. Celebrate all the magic of Disney’s Sofia the First! Girls will love reenacting favorite scenes or imagining new adventures and lessons for the adorable princess-in-training. 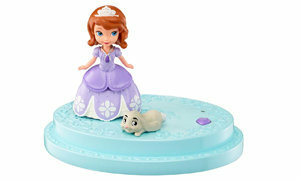 For a magical touch, the dolls also unlock phrases in Sofia the First’s Magical Talking Castle. Girls simply place the dolls on the “magic” base in the castle to activate. Collect all your favorite Sofia the First Dolls and Playsets to build the ultimate Enchancia kingdom (each sold separately). Includes Magical Talking Castle, Sofia doll, Clover figure, magical talking base, furniture accessories and more. Girls can play out their favorite scenes and moments from the show!